DD and I found this fellow Nicko and his YouTube cooking videos this week, and have been enjoying watching them. I used to live where folks spoke with an accent similar to the host’s, so that aspect is fun for me as well. I’m planning to make something just a BIT like this tonight — using commercial bratwurst “mince” as filling. My camera has been lost since 25 March (!! ), so I haven’t been able to take photos to share for a while. I could talk about some slightly older stuff. . . . 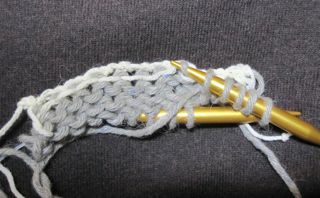 Here are steps for one way to work a tubular cast-on. Begin with a provisional (i.e. temporary, removable) cast on. I favor ones that use a crochet hook. Here, I’m crocheting loops over a knitting needle with smooth scrap yarn, unto half my desired total number of stitches (12, to end with 24). 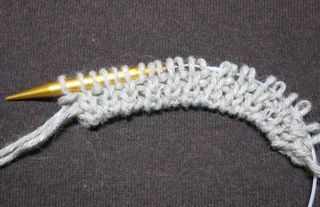 Now join the bottom and top edges of this short piece of knitting into a long, shallow tube (hence the “tubular” name) as follows. Knit 1 stitch from knitting needle. Continue across. 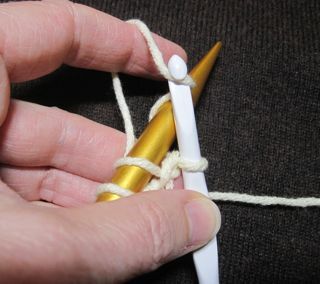 alternating a knit from the needle with a purl from the CO. 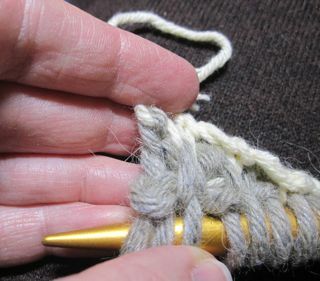 The final loop to purl is hard to see — fiddle until you find it, so that you’ll end with an even number of total stitches. 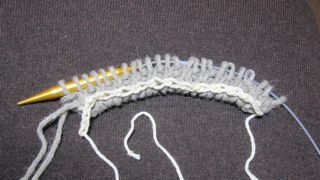 Continue in 1×1 ribbing, knitting the knits and purling the purls as established. After a few rows, you’re piece looks like this. You may remove the provisional cast-on now. 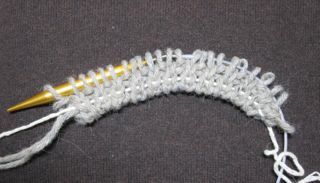 Pull the knotted end of the scrap yarn back through the last crocheted chain to free it up, then gently pull the strand, popping each chain one at a time, undoing your provisional CO. This is amazing to watch — so clever! 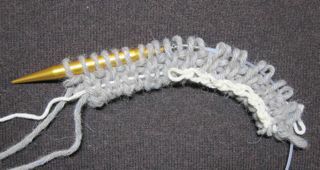 Pull strand entirely free from your knitting.